In 2010, Daniel completed a Bachelor of Environmental Science, graduating with first class honours from the University of Sydney. His honours research took him to the Northern Territory where he investigated the invasion dynamics of the cane toad in the arid zone as the toads marched into cattle country in the northern tip of the Tanami desert. This included investigating exclusion to invasion hubs and artificial watering points. Daniel worked in native bushland restoration in both on ground works and site management for a couple of years before being engaged by the Lachlan CMA in Cowra, NSW. Here he worked as an Environmental Liaison Officer alongside the Fenner research team on the Box Gum Grassy Woodland Environmental Stewardship Program (ESP). After working for around 12 months with the CMA, Daniel jumped ship to The Australian National University where he has worked since 2012 as a research officer with the Lindenmayer research group. From this time, he has assisted on the ESP and Grazing Study monitoring projects as well as with various field work for the group’s other long term monitoring studies across south-east Australia. 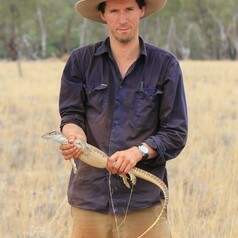 In 2013 Daniel took over the management of the ESP and Grazing Study from Geoff Kay, where he has since been running the monitoring program investigating the biodiversity outcomes of this large scale Australian Government agri-environment scheme. Daniel remains based in Cowra, which keeps him close to many of the long term monitoring sites in the region. He has a strong interest in the conservation of our native ecosystems, using scientific research to provide practical evidence-based solutions to effectively implement conservation within the agricultural landscape.